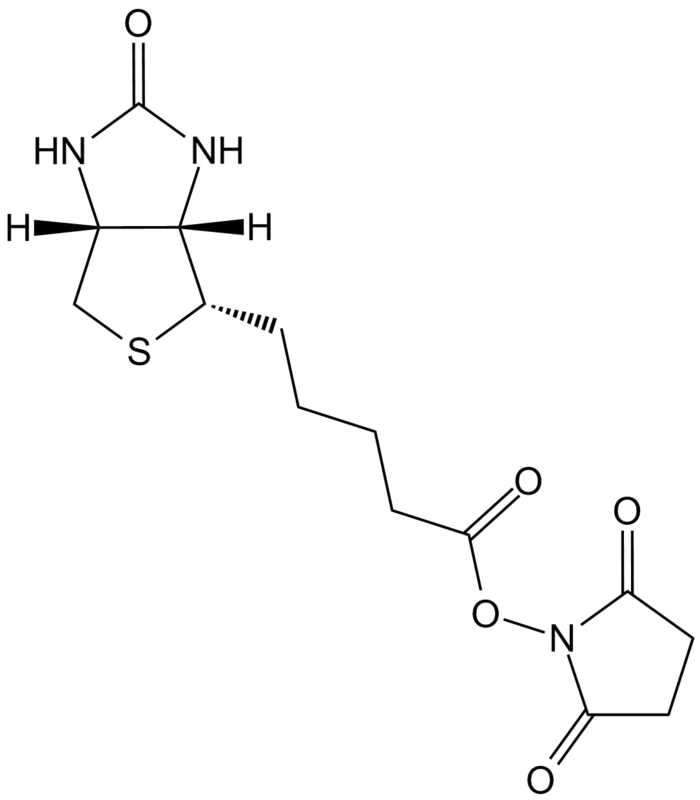 Description NHS-Biotin is the simplest NHS-ester activated biotinylation reagent used for intracellular labeling. Firstly, NHS-biotin was dissolved in DMSO at a concentration of 100 mg/mL, after that using 90% DMSO solution diluted the biotin to a concentration of 20 mg/mL. The biotin solution was sterilized by ﬁltering the solution through 0.2-μm pore nylon syringe ﬁlters and the solution was diluted with 6 volumes 0.9% saline solution. Blood was allowed to warm to room temperature prior to labeling with NHS-biotin. To achieve a biotin concentration of 0.04 pg of biotin/RBC（Red Blood Cells）, Biotin-DMSO-saline solution was injected into each blood bag and agitated for 30 minutes.
. J.E. Tomlinson, E. Taberner, R.C. Boston, S.D. Owens, and R.D. Nolen-Walston. Survival Time of Cross-Match Incompatible Red Blood Cells in Adult Horses. J Vet Intern Med 2015;29:1683–1688. NHS-Biotin (C14H18O5N3S) is N-hydroxysuccinimido biotin. It is the shortest of three similar EZ-Link NHS-Biotin Reagents that enable simple and efficient biotinylation of antibodies, proteins and any other primary amine-containing biomolecules in solution. 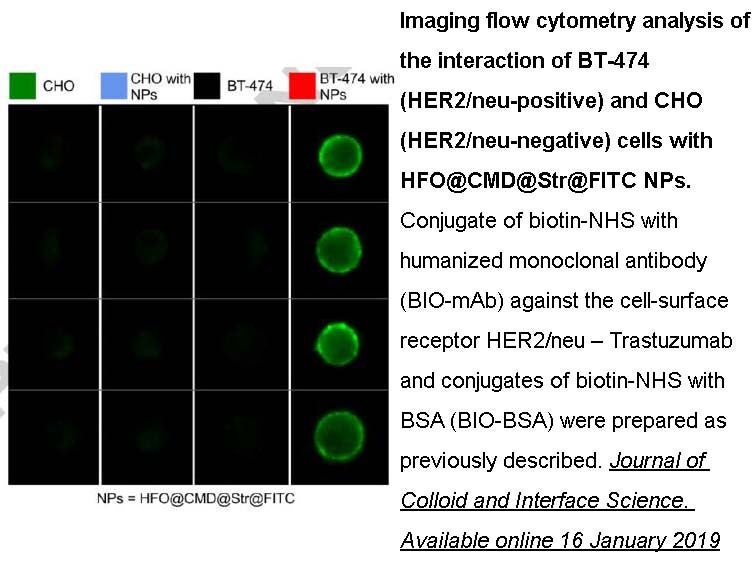 NHS-Biotin offers researchers the possibility of optimizing labeling and detection experiments where steric hindrance of biotin binding is an important factor. Because it is uncharged and contain simple alkyl-chain spacer arms, NHS-Biotin compound is membrane-permeable and useful for intracellular labeling. NHS-Biotin is the most popular type of biotinylation reagent. NHS-activated biotins react efficiently with primary amino groups (-NH2) in alkaline buffers to form stable amide bonds. Proteins (e.g., antibodies) typically have several primary amines that are available as targets for labeling, including the side chain of lysine (K) residues and the N-terminus of each polypeptide. Fouassier, L., Yun, C. C., Fitz, J. G. and Doctor, R. B. (2000). Evidence for Ezrin-Radixin-Moesin-binding Phosphoprotein 50 (EBP50) Self-association through PDZ-PDZ Interactions. J. Biol. Chem. 275, 25039-25045. Nunomura, W., Takakuwa, Y., Parra, M., Conboy, J.G., & Mohandas, N. (2000) Regulation of protein 4.1R, p55 and glycophorin C ternary complex in human erythrocyte membrane. J. Biol. Chem. 275(32): 24540-24546. Chiu, N.H. & T.K. Christopoulos. 1999. Two-site expression immunoassay using a firefly luciferase-coding DNA label. Clin. Chem. 45: 1954–1959..